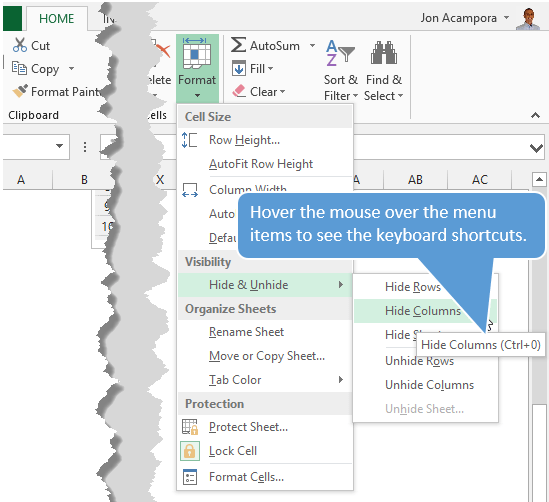 Bottom line: Learn some of my favorite keyboard shortcuts when working with rows and columns in Excel. 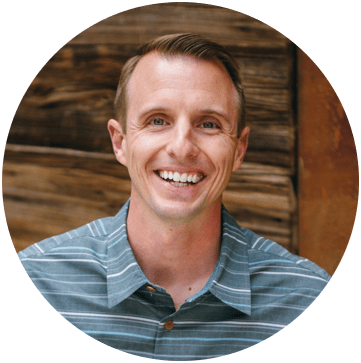 Whether you are creating a simple list of names or building a complex financial model, you probably make a lot of changes to the rows and columns in the spreadsheet. Tasks like adding/deleting rows, adjusting column widths, and creating outline groups are very common when working with the grid. This post contains some of my favorite shortcuts that will save you time every day. Shift+Space is the keyboard shortcut to select an entire row. Ctrl+Space is the keyboard shortcut to select an entire column. The keyboard shortcuts by themselves don't do much. However, they are the starting point for performing a lot of other actions where you first need to select the entire row or column. This includes tasks like deleting rows, grouping columns, etc. 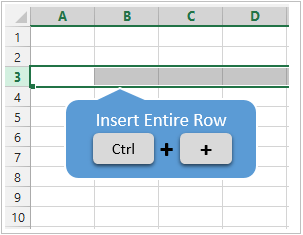 These shortcuts also work for selecting the entire row or column inside an Excel Table. When you press the Shift+Space shortcut the first time it will select the entire row within the Table. 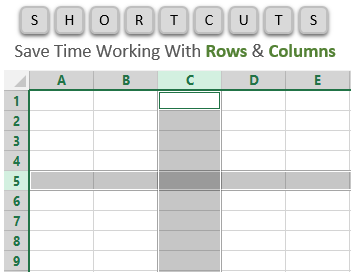 Press Shift+Space a second time and it will select the entire row in the worksheet. The same works for columns. Ctrl+Space will select the column of data in the Table. Pressing the keyboard shortcut a second time will include the column header of the Table in the selection. Pressing Ctrl+Space a third time will select the entire column in the worksheet. 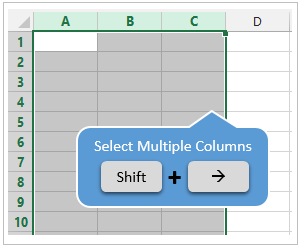 You can select multiple rows or columns by holding Shift and pressing the Arrow Keys multiple times. 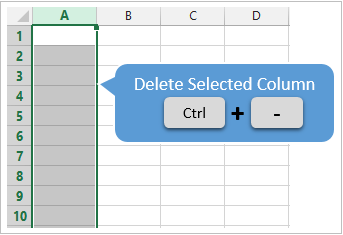 There are a few ways to quickly delete rows and columns in Excel. If you have the rows or columns selected, then the following keyboard shortcuts will quickly add or delete all selected rows or columns. Ctrl++ (plus character) is the keyboard shortcut to insert rows or columns. If you are using a laptop keyboard you can press Ctrl+Shift+= (equal sign). Ctrl+- (minus character) is the keyboard shortcut to delete rows or columns. So for the above shortcuts to work you will first need to select the entire row or column, which can be done with the Shift+Space or Ctrl+Space shortcuts explained in #1. 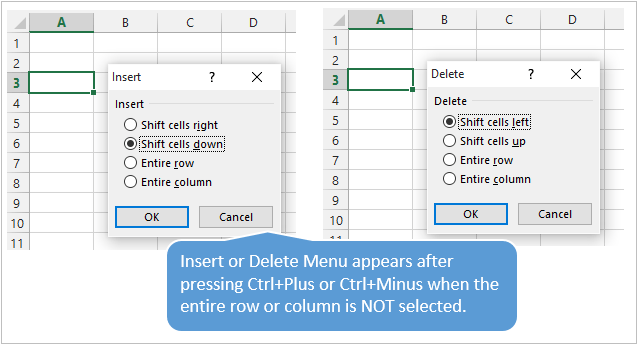 If you do not have the entire row or column selected then you will be presented with the Insert or Delete Menus after pressing Ctrl++ or Ctrl+-. You can then press the up or down arrow keys to make your selection from the menu and hit Enter. For me it is easier to first select the entire row or column, then press Ctrl++ or Ctrl+-. There are also a lot of different ways to AutoFit column widths. AutoFit means that the width of the column will be adjusted to fit the contents of the cell. You can use the mouse and double-click when you hover the cursor between columns when you see the resize column cursor. The problem with this is that you might just want to resize the column for the date in cell A4, instead of the big long title in cell A1. To accomplish this you can use the AutoFit Column Width button. It is located on the Home tab of the Ribbon in the Format menu. 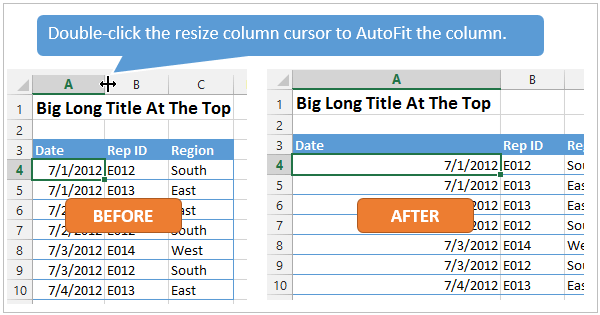 The AutoFit Column Width button bases the width of the column on the cells you have selected. In the image above I have cell A4 selected. So the column width will be adjusted to fit the contents of A4, as shown in the results below. Alt,H,O,A is the keyboard shortcut to AutoFit Row Height. It doesn't work exactly the same as column width, and will only adjust the row height to the tallest cell in the entire row. The column width or row height windows can be opened with keyboard shortcuts as well. Alt,O,R,E is the keyboard shortcut to open the Row Height window. Alt,O,C,W is the keyboard shortcut to open the Column Width window. The row height or column width will be applied to the rows or columns of all the cells that are currently selected. These are old shortcuts from Excel 2003, but they still work in the modern versions of Excel. There are several dedicated keyboard shortcuts to hide and unhide rows and columns. The buttons are also located on the Format menu on the Home tab of the Ribbon. You can hover over any of the items in the menu and the keyboard shortcut will display in the screentip (see screenshot below). The trick with getting these shortcuts to work is to have the proper cells selected first. To hide rows or columns you just need to select cells in the rows or columns you want to hide, then press the Ctrl+9 or Ctrl+Shift+( shortcut. 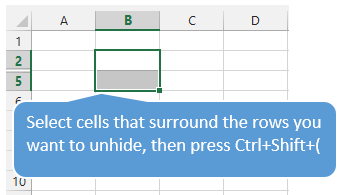 To unhide rows or columns you first need to select the cells that surround the rows or columns you want to unhide. In the screenshot below I want to unhide rows 3 & 4. I first select cell B2:B5, cells that surround or cover the hidden rows, then press Ctrl+Shift+( to unhide the rows. The same technique works to unhide columns. Row and Column groupings are a great way to quickly hide and unhide columns and rows. 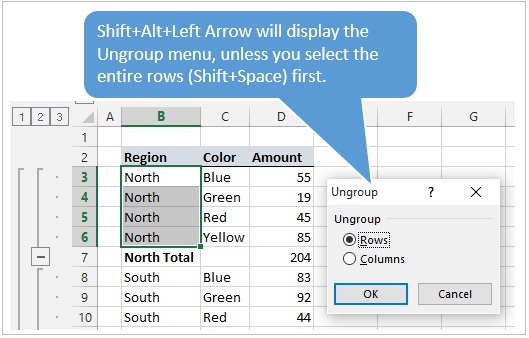 Shift+Alt+Right Arrow is the shortcut to group rows or columns. Shift+Alt+Left Arrow is the shortcut to ungroup. Again, the trick here is to select the entire rows or columns you want to group/ungroup first. Otherwise you will be presented with the Group or Ungroup menu. Alt,A,U,C is the keyboard shortcut to remove all the row and columns groups on the sheet. This is the same as pressing the Clear Outline button on the Ungroup menu of the Data tab on the Ribbon. *Bonus funny: At some point when using the group/ungroup shortcuts, you will accidentally press Ctrl+Alt+Right Arrow. This is a Windows shortcut that orientates the entire screen to the right. I call it “neck ache view”. To get it back to normal press Ctrl+Alt+Up Arrow. Previous Win a Copy of the New Mr. Excel Book! It’s Awesome! what is short key to auto adjust the column width as per data entry in the column. ALT+H+O+I works only to auto fit the length as per colume name size, but it doesn’t fit as per entire column width. i know there is short key to manually change the length as per desire, but i want short key to auto adjust the column width as per data entered in column. What is the shortcut for hiding and unhiding the columns and raws in windows 10. I am always using shortcut key when working in the excell work book, so this shortcut key are very useful for me. Great….. The shortcuts are worth remembering. Thanks Jon, most useful. The Ctrl+9 & 0 don’t appear to work in Excel 365, however Ctrl+O, etc works fine. Nice and useful tips John, Thanks…I too love keyboard shortcuts. Below are the steps for higher versions of Windows or Excel set up issues for the same with little changes mentioned already by Pablo for older versions. 5. Click Advanced Key Settings tab, and select Between input languages. 7. For Switch Keyboard Layout, select Not Assigned. 8.Click OK to close each dialog box. I hope this will solve your issue. how can i switch two raw (places) by using excel short cut with out using cut and paste. Thanks Dear for such a informative knowledge. I usually use short keys to insert or delete row and columns. But i found you by searching how to hide rows and columns with short keys. Is there an Excel shortcut for the vlookup function? I’ve searched online and cant find anything and then remember you’ve answered a question of mine before, in the above thread.